This year’s symposium in Japan, which combined the annual JACI/GSC Symposium with the International Conference on GSC, held biennially on a rotating basis in Asia, the U.S., and Europe, proved to be the largest ever symposium related to GSC. Furthermore, the definition of GSC (green and sustainable chemistry), as promoted by JACI, was reviewed during the symposium in response to developments in the field of chemistry. On the final day of the symposium, this revised conception of GSC was announced as the “Tokyo Declaration 2015,” based on a consensus of GSC stakeholders around the world. This was the fourth JACI/GSC Symposium held since 2012, the year after the Japan Association for Chemical Innovation (JACI) was established as a “Public Interest Incorporated Association” through a merger. The first joint JACI/GSC Symposium in 2012 combined four symposiums, including the GSC Symposium. JACI has incorporated into its symposium programs leading-edge information and strategic recommendations for the chemical industry, which it has promoted since its inception. In addition, it has continuously advanced the basic principles of GSC, as defined at the GSC Symposiums held annually between 2001 and 2011. The International Conference on GSC was held for the first time in the memorable year of 2003, as the 1st Tokyo International Conference on GSC. The first ever GSC Symposium was actually held in 2001, but along with the second GSC Symposium the following year, it was held merely as a preparation for the 1st Tokyo International Conference on GSC in 2003. From then on, the International Conference on GSC was held every two years in the U.S., Europe, and Asia, on a rotating basis. After Tokyo, the event was held successively in the U.S., Germany, China, the U.S., and the U.K. This year, precisely 12 years after that first conference in Tokyo, the International Conference on GSC returns to the city where it all started. 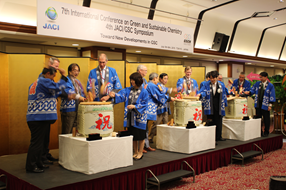 Thus, it was very fitting that the JACI/GSC Symposium and the (Tokyo) International Conference on GSC be held jointly. Naturally, JACI has worked long and hard on preparations for this year’s joint conference ever since August 2013, when the event was announced. One of its tasks was to review the concept of GSC, including its definition. 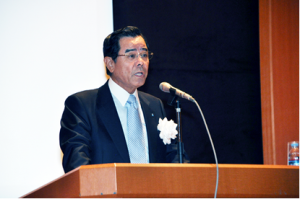 One of the plenary lecturers, Professor Emeritus Makoto Misono of The University of Tokyo, revised the GSC guidelines, around the idea of advocating GSC that is “More Positive” as well as “Less Negative,” and also provided more complete case studies of GSC. Among others, the GSC case studies continue to be based on the 12 principles of green chemistry jointly advocated in the 1990s by Anastas and Warner, but these have now been extended by the incorporation of the “More Positive” concept. In this way, they clearly indicate the direction of GSC for the future. With a total of 785 participants, this symposium was the largest GSC Symposium or JACI/GSC Symposium ever held. More remarkably, everyone seemed to find the rich program of the symposium enjoyable. At the banquet held on the third day, when the main guest speakers broke open a ceremonial sake barrel, the assembled participants reacted vocally with great enthusiasm. Since it happened to be the night of Tanabata, the symposium tree installed within the venue was decorated with tanzaku (colored strips of paper with prayers written on them) containing hopes for the field of GSCThe happy, smiling faces of the many people captured in the commemorative photos of that evening symbolize the success of GSC-7. Not only did the symposium come to a successful close, but hopefully the message relating to GSC will prove to serve as a source of guidance and inspiration for the activities of people involved in the chemical industry in the future. GSC-7 consisted mainly of two parts—lectures and exhibitions. The lectures were held on the second, third, and fourth days. There was a total of 81 technical lectures delivered, including four plenary lectures, 10 invited lectures, three GSC award winner’s presentations, and 19 keynote lectures. The exhibitions, held on the third and fourth days, consisted of a poster presentation session featuring 200 posters and 58 presentations on the activities of companies and organizations. In addition, on the first day Interaction with Students and Networking and Drinks, which served as welcome parties, were held. On the second day there was a panel discussion featuring plenary lecturers as panelists. On the third day, the commendation ceremony for the GSC Award was held, followed by a banquet. On the fourth day, the Commendation Ceremony for the GSC Poster Award was held, and the symposium concluded after closing remarks. Note that the Tokyo Declaration 2015 was announced during the closing remarks, after final editing of the statement text on the third day of the conference. Each item of the program is explained in order as follows. The Interaction with Students started at 4 p.m., the scheduled time for the start of registration for the symposium. 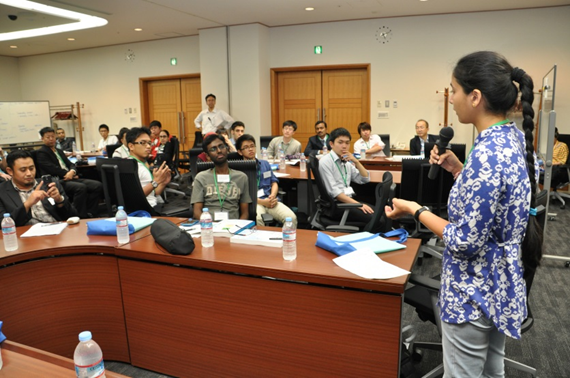 The session was attended by 19 young researchers from around Asia, invited as part of the Japan Science and Technology Agency’s SAKURA Exchange Program in Science, as well as 10 other participants from abroad, and approximately 10 Japanese participants. The assembled students discussed GSC-related matters . Many of the students actively expressed their opinions and they found the exchange to be very valuable. Subsequently, the Networking and Drinks was performed. There were no special program items on the first day; the main activity was registration. Still, approximately 50 people participated. It was a relatively simple gathering, but many of the predominantly foreign participants could be seen enjoying themselves chatting until near the end of the scheduled program. The opening remarks of the symposium was given by JACI President Kyohei Takahashi. After relating the history of the symposium, he explained that this year’s symposium would explore a new approach to GSC and lead to a further advance in GSC activities. Next, a special speech was delivered by current Keidanren (Japan Business Federation) Chairman Sadayuki Sakakibara, who also serves as president of the Chemical Society of Japan. In his talk, he stressed that chemical innovation based on GSC represented a road to Japan’s revival, pointing out that in the past 20 years the chemical industry has grown to account for a larger slice of Japan’s economy, despite the fact that GDP has remained stagnant in this time. Citing the example of two particular products based on GSC (carbon fiber, and reverse osmosis membranes), Mr. Sakakibara explained that the development of environmentally friendly products is becoming increasingly important. The next item on the program was the first plenary lecture, by Professor Emeritus Makoto Misono of The University of Tokyo, which focused on raising awareness of the theme of the symposium. He expressed his view that while the pursuit of wealth and environmental sustainability simultaneously is very difficult, it is possible. His contention is that although GDP growth and environmental impact have increased in proportion to one another throughout the course of human economic development up to now, we can think of ways to limit environmental impact while still increasing GDP. Professor Emeritus Misono illustrated this relationship as an environmental Kuznets curve and proposed Environmental Impact (EI) as an indicator. He explained that promoting “positive” GSC is essential for improving EI. As an example, he mentioned paper nappies, which are effective both in preventing environmental pollution and enabling lifestyle convenience. The first invited lecture was presented by Professor Kazuhito Hashimoto of the University of Tokyo, who discussed Japanese national policy from the standpoint of GSC. As part of the current effort to recover from 20 years of stagnation by reviving Japan’s economy, through “Abenomics,” a number of cross-governmental collaborations with industry and academia have been promoted, including SIP (Cross-Ministerial Strategic Innovation Promotion Program) and ImPACT (Impulsing PAradigm Change through disruptive Technologies). On top of this, research and development relating to cutting-edge chemistry, incorporating information and communications technology (ICT) is also likely to be promoted in the coming years. Japan has a track record of overcoming environmental pollution problems, and in this sense, it has become a world leader in developing solutions to environmental challenges. Professor Hashimoto stated that it is essential for Japan to continue steadily developing innovative technology and to face the challenges of solving global-scale environmental and energy problems. The second plenary lecture was by Dr. Gernot Klotz, who talked about GSC-related initiatives in Europe. Dr. Klotz claimed that research and development relating to forms of industry and economic efficiency, and value chains are required for solving the problems that humanity is grappling with. These problems, such as climate change, health and aging, and energy, require a new approach, centered around innovation and based on integration and cooperation. As an example, he presented the sustainable industrial process model promoted by SPIRE (Sustainable Process Industry through Resource and Energy Efficiency), which many European companies are participating in. Dr. Klotz also talked about Suschem (European Technology Platform For Sustainable Chemistry), which engages in a wide range of activities in the fields of bio-energy, transport, resources, and health, with a view to solving pressing societal problems. The third plenary lecture was delivered by Dr. David Constable, Director of the American Chemical Society Green Chemistry Institute (ACS GCI), titled “A Survey of GSC in the U.S.” In this talk, Dr. Constable outlined the state of green chemistry from various standpoints of the public, academia, government, and NGOs in the U.S. He explained that amongst the public, the terms “green chemistry” (GC) and “sustainable chemistry” (SC) are used interchangeably, and that even in educational environments the concept of GC has not yet penetrated sufficiently. 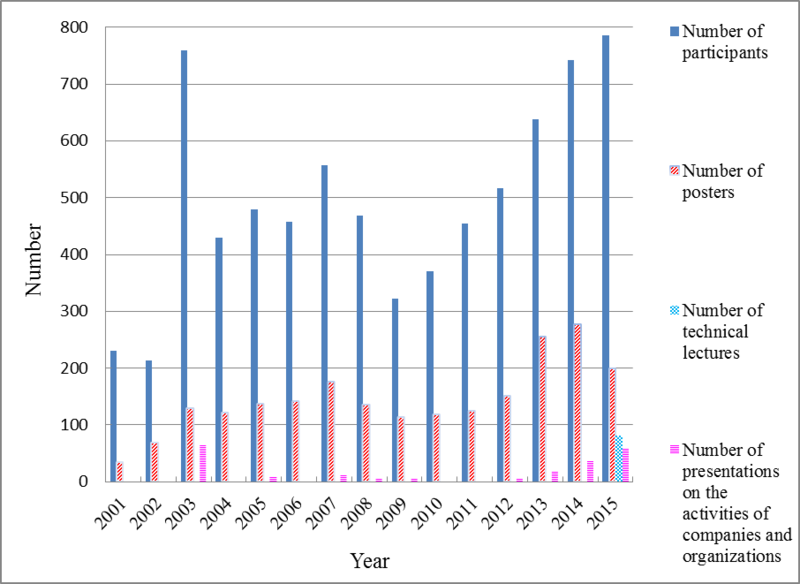 In recent years, however, GC and SC have been actively promoted by the government, and Dr. Constable presented examples of collaborative projects with the EPA (United States Environmental Protection Agency) and NASA. He also reported that NGOs in the U.S. are very actively promoting the concept of GSC, and that while ACS GCI is pouring a lot of energy in to education, it has also developed close ties with the U.S. chemical industry. The second invited lecture was delivered by Dr. Carsten Sieden of BASF. According to Dr. Sieden, as the world’s largest chemical company, with a history spanning 150 years, BASF’s economic success up to now can largely be attributed to the fact that it has diligently met its obligations of environmental protection and social responsibility. It is predicted that by 2050 the world’s population will exceed 9 billion and that environmental pollution will become severe. Over this same time frame, the importance of the chemical industry is expected to rise steadily. BASF employs more than 10,000 researchers all over the world, to grapple with long-term research and development challenges and to solve problems in all kinds of chemical fields, always with a steady eye on the future. 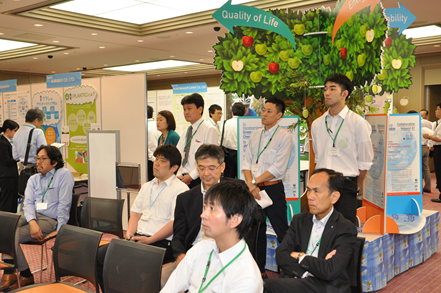 BASF tackles issues related to climate and the environment, food, and lifestyle improvement. Some areas of potential future growth it has identified include reducing the weight of automobiles, electric batteries, enzymes, electric power generation, and biotech. In addition, Dr. Sieden described how BASF is pursuing the development of technology to simplify manufacturing processes, utilizing biotechnology. The third invited lecture was given by Dr. Yao Weiguang, Global Director of The Dow Chemical Company, titled “The Dow Story: Now and the Future.” In his talk, Dr. Yao explained that Dow’s strategy to shape a sustainable society is divided into three stages. In the first phase from 1995 to 2005 the aim was to minimize the company’s footprint on a global scale, focusing on the 2005 goal of EH&S, meaning environment (E), health (H), and safety (S). The 2015 sustainable society goal is aimed at trying to actively solve the world’s social problems by offering innovative products and solutions. Now, in the third phase of the strategy, the 2025 sustainable society goal is to effectively reduce the footprint of the company further, by continuing to provide blueprints for a sustainable earth and society and creating customer value. Dr. Yao described how Dow is working to achieve this goal, confronting challenges in the fields of energy, climate change, water, food, housing, and health, by realizing a worldwide recycling-based economy, through innovations at the crossroads of chemistry, biology, physics, and other sciences, and the development of collaborative relationships. The fourth invited lecture was delivered by Dr. Glenn Fredrickson, Executive Officer of R&D Strategy Office, Mitsubishi Chemical Holdings Corporation (MCHC), who offered an explanation of his company’s “KAITEKI” concept of value. The Japanese word kaiteki, which approximately means comfort, serves as MCHC’s motto of aiming for the development of an environmentally, socially, and economically sustainable society. In his talk, Dr. Fredrickson described the properties of some of the products the company has developed based on the KAITEKI concept, including energy-related products like LED materials, carbon fiber, and organic solar batteries, and the bioplastics DurabioTM and PBS (polybutylene succinate), which are sorbitol-based polymers. He also demonstrated the diversity of these materials. The fifth invited lecture was delivered by Professor Milton Hearn of Monash University, who discussed the importance of the GSC concept from a scientific standpoint, with reference to the synthesis of chemical, pharmaceutical, and food components. There are currently over 100,000 chemical substances in industrial use and a further 15,000 new substances are registered each year with the CAS. Many of these are derived from fossil fuels, however, which according to Professor Hearn leaves chemists with a challenge in the future. To ensure the high level of living environment conservation expected in recent years, chemists and engineers engaged in the chemical industry will need to meet increasingly stringent social and economic demands in the future. Chemistry has a major role to play in developing more efficient production methods and creating less toxic substances. On the evening of July 6, a panel discussion was held, moderated by Professor Kazuhiro Mae of Kyoto University, and featuring a number of the plenary and invited speakers as panelists. The panel discussion began with a debate on what sustainability really means. Professor Hearn of Monash University, who had talked earlier about establishing more efficient and less toxic methods for synthesizing chemical products from a GSC perspective, contended that sustainability means an environment in which waste that cannot be recycled no longer exists, and that this definition can serve as an indicator not just in the field of chemistry but also in many other fields. Dr. Fredrickson, the Executive Director of MCHC touched on his company’s KAITEKI concept, which he outlined in his earlier talk, describing it as “the effort to improve health, comfort, and sustainability,” adding that the world’s companies need to work together to generate innovation in application development. Professor Emeritus Misono of the University of Tokyo pointed out that given the competition that exists between petroleum and biomass in the chemistry world, it is very important to push for “Less Negative” as well as “More Positive” outcomes. In response to this, Dr. Constable, one of the plenary lecturers, stressed the reality that chemical products are currently based largely on petrochemistry, and that although there is still a lot of room for improving them in many different ways by means of GSC, consumers are generally unwilling to pay the additional cost, even for excellent GSC-based products. Similarly, Dr. Klotz, another plenary lecturer, pointed out that even materials of excellent recyclability have to demonstrate their performance when the consumer uses the product, and that sustainability must be viewed through the lens of the value chain that extends from the procurement of raw materials to final consumption, with constant links to the creation of innovations to produce products offering a competitive advantage. Finally, the moderator, Professor Mae summed up the discussion by saying that innovation in the field of chemistry is considered necessary to solve problems and that in order to shape a sustainable society, future-oriented research and development and the generation of environment-friendly innovation must be achieved through collaboration between industry, academia, and government. On July 7, there were two invited guest speakers from user industries. One of these, the sixth invited lecture, was delivered by Mr. Taiyo Kawai of Toyota Motor Corporation. In 2014 Toyota released its MIRAI FCV (fuel cell vehicle) in Japan. FCVs are fueled by hydrogen, which causes no environmental pollution, has an energy density greater than electric batteries, and is excellent in terms of transportation and storage. For these reasons, hydrogen is considered an important energy source for the future. Currently, as of July 2015, the cost of an FCV is more than 7 million yen, but the price can be significantly reduced in the future. Although there were only 71 hydrogen stations across Japan as of April 2015, the number is expected to increase in the coming years and the cost of hydrogen is also expected to decrease. The seventh invited lecture was given by Mr. David Cox, Executive Director for Asia of Veolia, the world’s largest water resource management company. According to Mr. Cox, no more than 1% of the earth’s water can be used, and this usable water is also unevenly distributed over the earth. Trends in water supply and demand are heading in exactly the opposite directions to those needed for sustainability. Consequently, the future of water is increasing stress. Three main interrelated factors―population growth, economic growth, and climate change―are driving this. Chemical technology is indispensable for the recycling of water, and Veolia is already engaged in joint projects with major chemical companies such as Shinopec, P&G, and Dow Corning. Cooperation between the chemical industry and water industry is essential for creating a sustainable world. On the morning of July 8, Professor Shu Kobayashi of the University of Tokyo delivered the eighth invited lecture. Professor Kobayashi is a proponent of “dream catalysts.” These catalysts have the advantages of both homogeneous catalysts, which can be used under homogeneous conditions, and heterogeneous catalysts that are used under heterogeneous conditions. They possess the properties of high reactivity, high selectivity, and asymmetric catalysis, but also the characteristics of low waste, recyclability, and industrial ease-of-use. Nanoparticle catalysts with metal ligands are a type of dream catalyst that are effective in reactions such as hydrogenation, coupling, amidation, and alcohol oxidation. Professor Kobayashi presented an example of the synthesis of multi-stage amino acid derivatives, to show that dream catalysts are also effective in flow systems. Professor Youn-Woo Lee of Seoul National University delivered the ninth invited lecture, on the topic of supercritical utilization technology. As an example of synthesis under supercritical conditions, he explained the industrial implementation of the supercritical water oxidation of LiFePo4, a battery cathode material, and terephthalic acid waste solution, explaining that the process of commercializing this technology is well advanced. Professor Lee described a scheme in which supercritical water oxidation (SCWO) and supercritical water synthesis (SWS) occur simultaneously, with the heat generated by the exothermic SCWO reaction causing acceleration of the SWS, while the nanoparticles generated by the SWS cause acceleration of the SCWO reaction. He reported that this scheme can be effectively used for recovering metal from waste water. The tenth and final invited lecture was given by Professor Walter Leitner of RWTH Aachen University, who discussed the significance of setting up chemical value chains that utilize CO2 as a raw material and the feasibility of this. For example, the production of polyurethane and cyclic carbonates and polycarbonates by synthesizing ethylene oxide derivatives together with CO2 is industrially implemented. Another process under consideration is the production of CH4, hydrocarbons, and methanol using solar energy for the direct hydrogenation of CO2. In addition to the synthesis of hydrogen and CO2, Professor Leitner also reported on catalysts for synthesizing various kinds of chemical compounds and offered a look at expected future developments. To begin, Mr. Tani talked about promoting effective utilization and recycling, to overcome the problems of energy supply, global warming controls, and natural resource limitations, which Japan has continued to grapple with since the Great East Japan Earthquake of 2011, emphasizing that the chemical industry has a very big role to play in meeting these challenges. After stressing the importance of GSC measures, he touched on Professor Emeritus Misono’s proposal of advocating “More Positive” measures focused on “the sustainable development of society” in addition to “Less Negative” measures targeted at reducing the burden on the environment, pointing out the importance of both the Tokyo Declaration made 12 years earlier and the Tokyo Declaration 2015, which was set to be announced immediately following his lecture. Finally, Mr. Tani raised the idea of the “Medici effect,” which has been a hot topic amongst researchers interested in innovation, expressing his hope that this gathering centered on GSC will lead to further innovation. And on this note, he concluded his talk. There were 200 registered poster presentations, but at this symposium the method of poster classification was quite different to that of previous conferences. Firstly, the posters were classified according to the following categories of social objectives. A. Sustainability, B. Low Carbon, C. Quality of Life, D. Energy, and E. Pioneering Challenges. These categories correspond to worldwide “mega-trends”. The important categories were further divided into seven technical categories: Energy/Resources, Reactive Media, Polymers, Special Materials, Organic Synthesis, Biomass, and Catalysis. Note that E. Pioneering Challenges was not divided into any sub-categories. Organizing these posters around these social categories and further classifying them in terms of technologies, resulted in a poster exhibition that was significantly different to those of past conferences. The posters were posted alongside displays presenting the activities of companies and organizations, and these were placed within the exhibition venue. The “symposium tree,” symbolizing the symposium theme, “Toward New Developments in GSC,” was placed at the center of the space, with posters arranged around it and divided into the social categories—A. Sustainability, B. Low Carbon, C. Quality of Life, and D. Energy, then into technical categories. Details are given separately. There were 81 applications for the Poster Awards, of which 10 were selected for awards based on the results of a judging process. These 10 poster presentations are shown in Table 1. Three of the 10 award winners were by companies; the other seven by universities. 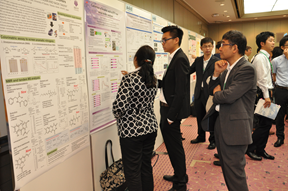 Also, as part of the Japan-Asia Youth Exchange Program in Science of the Japan Science and Technology Agency, 19 young Asian researchers were invited to GSC-7 on condition that they make a poster presentation. Of these, two won a poster award. These two young researchers were the only award winners from overseas. This report offers an outline of the poster session, focused on the award winning presentations. Raksit et al. from Chulalongkorn University (A-3-03) contributed a presentation on the copolymerization of the biodegradable polymers PLA (polylactic acid) and PBS (polybutylene succinate), showing how they managed to produce a comb-shaped high polymer. The innovation is expected to be useful in pharmaceutical and biomedical applications. Kikushima et al. from Osaka University (A-5-07), developed a pathway for the synthesis of perfluoro butadiene with a global warming potential (GWP) close to zero, via a trifluorovinyl zinc salt, using tetrafluoroethylene as a raw material. Fujimoto et al. from Ube Industries (A-6-09) reported a method for the synthesis of 1,5-pentanediol, using tetrahydrofurfuryl alcohol extracted from inedible biomass (corn cobs). This method achieves an atom efficiency of nearly 100% without the use of solvents. Su Yang et al. from the University of Science-Malaysia (A-6-10) researched the ground-state collapse of polyhydroxyalkanoates (PHAs), which are biodegradable polymers, investigating in particular the impact of collapse on microbiomes. The team was able to verify that PHA collapse occurs differently in different microorganism environments. Sawa et al. from Kyushu University (A-7-08) elucidated a pathway for direct synthesis of ketimines (including triple-bond compounds) by means of catalytic asymmetric activation of alkanes. In addition, they reported achieving high yields of α-ketiminophosphonates and cyclic N-sulfonyl ketimines in the presence of rhodium acetyl complexes, with high levels of activation as a result of enantioselective reaction. Tsuneoka et al. from JX Nippon Oil & Energy (B-4-07) reported on their creation of a device for manufacturing high-purity hydrogen for use in fuel cells, which require a hydrogen purity of 99.99%. Yanai et al. from Kyushu University (D-1-08) presented a technology for photon upconversion, which converts low-energy light to high-energy light to enable its reutilization. The mechanism employed to achieve this, known as triplet–triplet annihilation (TTA), has drawn considerable research attention, but now Yanai et al. have managed to verify the functioning of this mechanism through an experiment in which they dissolved colored donor and acceptor molecules in an organic solvent. Watanabe et al. from Hitachi Chemical (E-8-04) prepared a presentation on a giga-porous polymer-agarose matrix (GPAM) for refining proteins. GPAM is created by linking the hydrophobic groups within agarose into a high polymer to form a hydrophobic agarose-like structure. Using this mechanism, the team was able to create a column that enables protein refining columns to be operated at low pressure. Yamaguchi et al. from the Tokyo University of Science (E-8-26) successfully created a highly crystalline perovskite oxide powder using the sol-gel method at 60°C or below. More specifically, the team dissolved titanium(IV) chloride in water at 4°C and then added some aqueous solution of ammonia to obtain a solid titanium oxide gel at a pH of 8.5. They then mixed this with an alkaline earth hydroxide and after storing the mixture in argon at 60°C or below, they obtained highly crystalline SrTiO3 and BaTiO3. Tajima et al. from Yokohama National University (E-8-35) managed to produce fine hollow particles of polypyrrole, in the size range of 300 to 700 nm, from nano bubbles created using an ultrasonic stirrer. The oxidative polymerization to create the fine hollow particles was performed by ultrasonically agitating an aqueous solution of pyrrole at 20 kHz and adding an aqueous solution of FeCl3. The nano bubbles obtained with this method are on average 143 nm in size, with a zeta potential of –33.9 mV and a density of 4.6×108 mL-1, which is more than 10 times greater than previous efforts. Furthermore, the nano bubbles persisted for several weeks. This persistence of these high-density nano bubbles is considered to be the main factor in the success of this research project. The symposium drew a total of 785 participants, including 65 invited guest speakers, 45 other lecturers and moderators, 67 committee members and organizers, 494 general attendees, and 114 students. In addition, there were 200 applications for the poster presentation and a total of 81 scheduled technical lectures (not including the invited lectures, but including the 20 keynote lectures), and 58 presentations on the activities of companies and organizations. In terms of participant numbers, this was the biggest ever GSC or JACI/GSC symposium. Furthermore, even excluding the plenary lectures, invited lectures, and GSC award winner’s presentations, there were 281 technical lectures and poster presentations. This number too was the biggest on record. The 2015 JACI/GSC Symposium showed that since the 9th GSC Symposium held in 2009, which drew a little over 300 people and was affected by the recent Global Financial Crisis, there has been a steady and comprehensive increase in the scale of the event. The number of posters and presentations on the activities of companies and organizations has also risen steadily. It is fair to conclude, then, that the recognition and influence of the JACI/GSC Symposium is steadily growing.